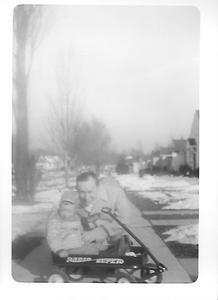 Winter, 1953 – On the sidewalk in front of our first home, Dad prepares to take me for a ride in my Radio Super. Note: he’s the one WITHOUT a proper hat!! 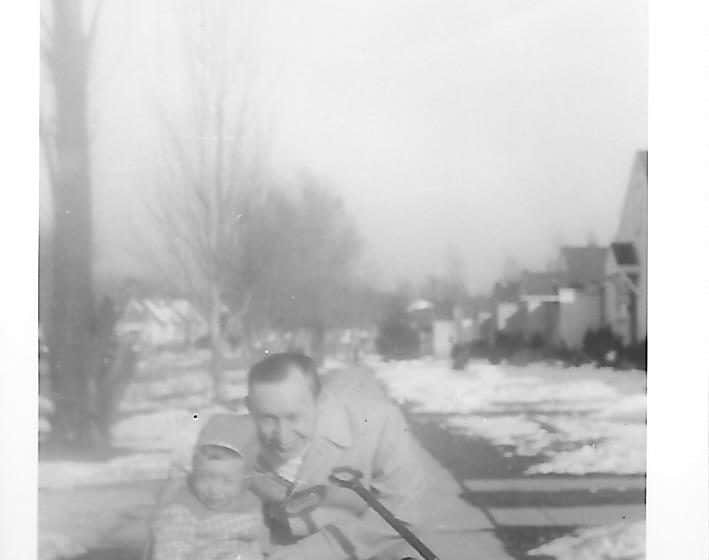 In January of 1953, when I was eighteen months old, my parents purchased their first home on West 89th Place in Evergreen Park, IL. As a result, they moved a little over three miles southwest from their apartment at 65th and Maplewood. Located in the Marquette Park neighborhood of Chicago, their building nestled closely with other apartments and brick bungalows. Due to a severe attack of gastritis at fifteen months, it took another two months for me to walk unassisted. 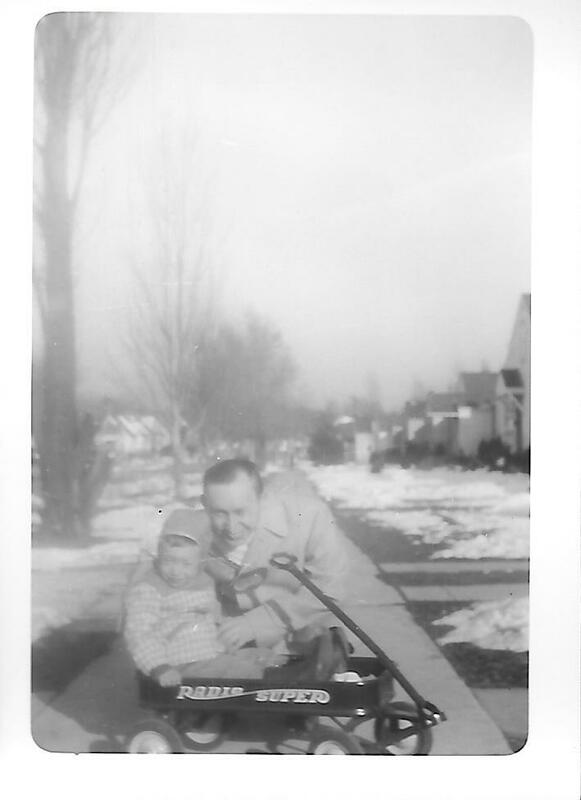 However, as Mom wrote in her account of my early years: “Once you started, you ran everywhere.” Perhaps that’s one reason they made the major financial commitment to home ownership in spacious Evergreen Park. I needed freedom to roam the suburbs! In the story behind “Your Love Defends Me,” singer/songwriter Matt Maher offers the following observation. He states that our society finds itself increasingly less and less capable of sitting still. Thus, what people do at any particular moment defines them. Furthermore, we live in an age where everyone’s fighting for some type of cause. Yet, to achieve that cause, we must do the exact opposite. Like the Israelites facing the menacing Egyptian army near the Red Sea, God wants us to stand over there and wait. That requires commitment, the foundation of intimacy. For without commitment, there’s no trust. And without trust, we lack intimacy. In addition, since God created us in His commitment-making, commitment-keeping image, we’re drawn to commitments. Yet, the very idea frightens some people. Because they perceive that commitment limits freedom. In truth, commitment paves the pathway to freedom. Therefore, when you, through the power of the Holy Spirit, commit yourself to a noble calling of God, He releases His power in your life. You find yourself. So, when you’re unable to do the “next right thing,” seek God- the strength of my soul. As you reach the end of yourself, stand over there. Be still. Declare what God’s strength will accomplish. Yes it is a commitment we need to make to God. I don’t think anyone, ever or anywhere have kept a perfect, unfaultering commitment to anyone let alone God. But it’s interesting that the more you try to do it, the more you do it, as you discover beyond a doubt, it’s all up to Him. Yep, one needs to be still and listen!